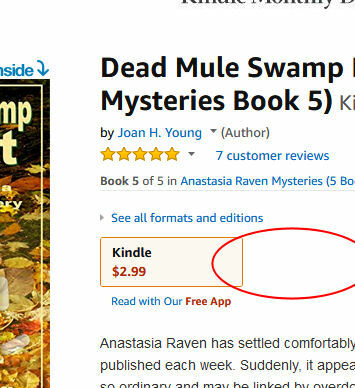 Now that Kindle and CreateSpace are not altogether the same thing, your paperback and electronic editions of the same book may not be automatically linked. Does this matter? Yes! 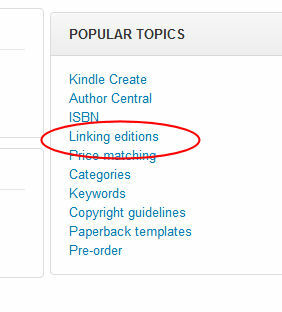 If they are not linked, when people find your title, they will see one or the other editions but not both. Where that red oval is in the graphic under "see all formats and editions," it should have another box for "paperback." People are going to think you didn't offer both choices. This can be solved. If you just published a book, wait at least three days for them to link automatically, but if they don't you can request it be done manually. You have to log in to your Kindle Account and find a screen where the link for Help appears at the top. It's not on every screen! Click it. Then find the box called Popular Topics, and choose Linking Editions, then Contact Us in the body of the text. There is a pre-filled list of questions for you to answer. Essentially, they want to be sure everything about the editions matches. They'll ask for the ISBN and ASIN numbers. Submit the info. I've had to do this a few times now, and the links have been created within a day. This can also be done if there are problems with audiobooks or multiple editions of a title not being linked.